Welcome to KushMart! Everett's busiest Recreational & Medical Cannabis Retailer. We strive to provide great service, wide selection & famously low prices giving our customers the best value in town, those are just a few reasons why you should stop in Kushmart today. 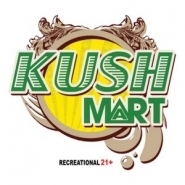 KushMart is a Medically Endorsed WA State Licensed Recreational 21 + w/ ID Marijuana Retailer. Conveniently located in the heart of Everett on Evergreen right across the street from Value Village. We carry an expansive CBD product line and have on Staff Medical Consultants. Weekly Deliveries of fresh flower, concentrates, edibles and joints, keep our recreational shop loaded, just for you. KushMart owners & team members have 20 plus years of combined Industry Work/Study in growing, retailing, loving, promoting, smoking and eating this plant. We Stock the Best Washington State Producers including Ethos, Fireline, Rogue Raven, NWCS, Doc Croc, Oleum, Avitas, From the Soil, Sweet Water, House of Cultivar, Legit, Harmony farms, Artizen, Freddy Fuego. Offering multiple price point options in flower, concentrates, tons of edibles etc. Always Good deals on bulk flower, full gram vape cartridge starting at $40, bho shatter 1g @ $15, half ounces as low as $40!! !